NVEY ECO is an Australian brand that offers natural and certified organic makeup. They use a talc-free base (utilizing corn starch instead) and focus on good-for-you ingredients such as jojoba oil, vitamins, chamomile, and carrot seed oil. Australia has always captured my imagination (kangaroos! koalas! wombats! 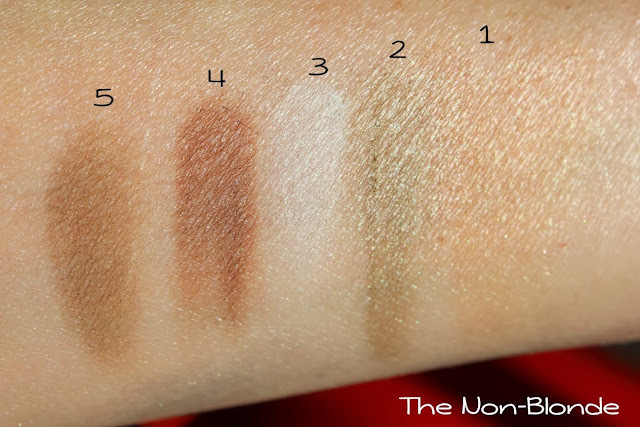 Basically all of my fantasy pets), so I was happy to hear NVEY ECO is now available at Ulta with more and more items to arrive in the US soon, such as five color eye shadow palettes you see here as an exclusive sneak peek. 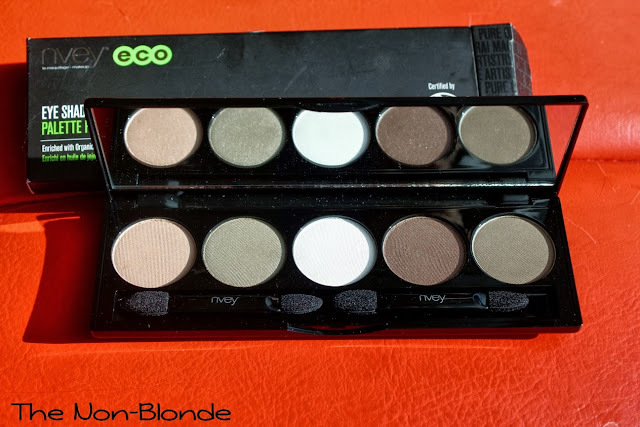 NVEY ECO Eye Shadow Palette #3 includes shades number 152, 153, 161, 155, and 158. All of them are easy to wear neutrals with a good color payoff (the swatches above show one swipe of color each with the basic sponge applicator that's included in the palette over primed skin). The texture is soft and gives a satin finish (except for the matte white color in the middle). As you can see, the beige eye shadow on the left is basically a slightly warmer version of my skin color, but it shows better on my lid and acts as a good base or wash of color for a barely-there makeup look. I've mixed it with the white color for slightly more impact and used the darkest brown in the crease and outer v for some serious drama. Obviously, these colors lend themselves for a variety of looks. They have a fall vibe going- the slightly warm, a khaki accent-- it's pretty much foolproof. As I mentioned above, the palette comes with those silly sponge applicators, but otherwise it's quite sleek. The slim compact reminds me of the Louise Young palettes and slides into small makeup bags and clutches easily. Bottom Line: not just for the crunchy granolas. 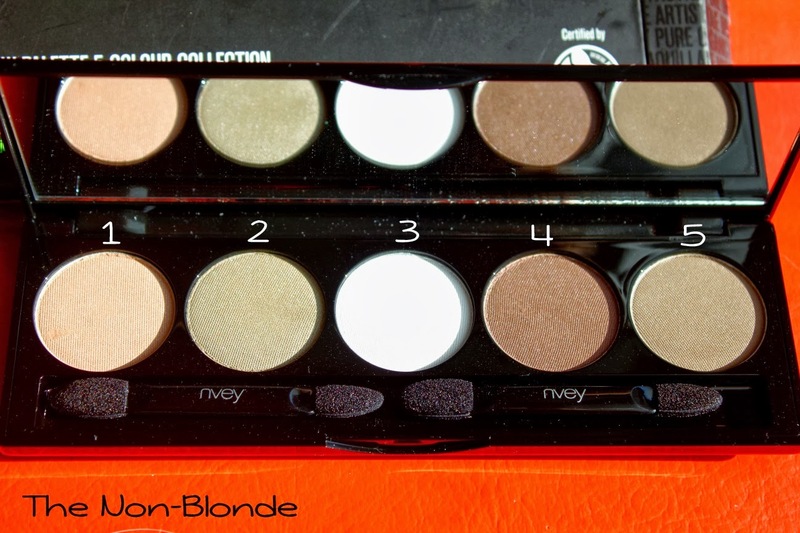 NVEY ECO Eye Shadow Palettes will be in the US soon. 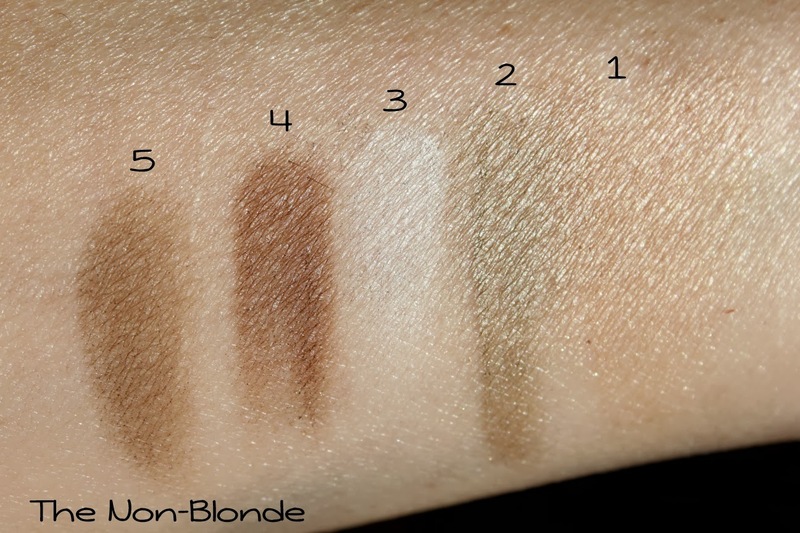 Right now you can get the single eye shadows at Ulta ($18 each), though most of the colors featured in the No. 3 Palette are not available online. The product for this review was sent by PR.